Every month we are featuring one pet on our Facebook cover photo and website. 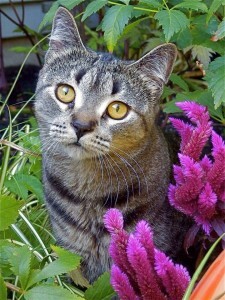 June’s Pet of the Month is Bobbi! Here is Bobbi’s story. In October 2013, a kind man trapped and brought a litter of 10 feral kittens into Langley Animal Protection Society (LAPS) when they were 6-8 weeks old. This litter would come to be known as the Jungle 10 litter on www.tinykittens.com. Bobbi started off life rough as she was malnourished, full of parasites, had an upper respiratory infection, fever, dehydration, lung worms and the dreaded ring worm! Bobbi and her brother Leo were adopted by their mom after she helped out with their care for months. After 2 months in her new home, it was discovered that she was 100% FeLV positive after running both tests. She lives life to the fullest in a low stress, children free home where she gets a great diet, loads of love and regular check ups. If she sneezes mommy rushes her into the vet. Here are some fun facts about Bobbi. Her nicknames are Bobbles, Bobblet, Adorabobble and Little Lamb. She loves baths from her big brother. Leo kept close watch over her when they were weeks old and always bathed her, and a year and a half later he still does it. Her super power is killing you with cuteness. She loves spring toys and balls, and her favourite place to sleep is in front of the fire in her clam bed. Her biggest accomplishment is raising $10,201.00 to date for LAPS. LAPS didn’t test for Feline Leukemia prior to the Jungle 10 litter as the funds just weren’t there. This fund now allows them to test all pregnant moms, babies and high risk cats that come into the shelter. Bobbi donated positive blood to Dr. Ferguson at Mountain View Veterinary Hospital and together with their lab are able to do group testing on mom and babies. Bobbi also had 2 siblings pass of FIP so her and her brother gave DNA cheek swabs for research into this awful disease. Bobbi has 2402 Facebook followers and counting (Leopard, Bobcat and Big Brother Jager), and last but not least she loves fresh cat grass. The best part about that is she likes it hand fed to her blade by blade. It’s very adorabobble! Bobbi and the Jungle 10 were fostered by the BEST foster Meowmy in the world, she broadcasts live all her births and litters, check her out at www.tinykittens.com and you can read more about the Jungle 10 litter there. To donate to LAPS, visit www.lapsbc.ca.